This is where understanding exactly which mental skills are necessary for elite soccer success comes in to play. 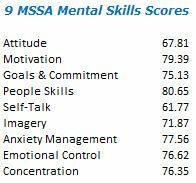 To quantify and qualify the mental skills of the emerging pro player, the Nine Mental Skills of Successful Athletes Assessment (9MSSA) was administered to this 30-player group. The 9MSSA was created by Dr. Jack Lesyk, Director of the Ohio Center for Sport Psychology, former Sport Psychologist for the Cleveland Cavaliers, and past President of the Association for Applied Sport Psychology. With his permission, I created a soccer specific version which was used for this study. The nine skills are Attitude, Motivation, Goals & Commitment, People Skills, Self-Talk, Imagery, Anxiety Management, Emotional Control, and Concentration. The 9MSSA work as a pyramid divided into three sections. Basic Skills are the basis for how a player acts and conducts himself both on and off the field. Preparatory Skills are the mental skills a player utilizes to get ready to train and play. 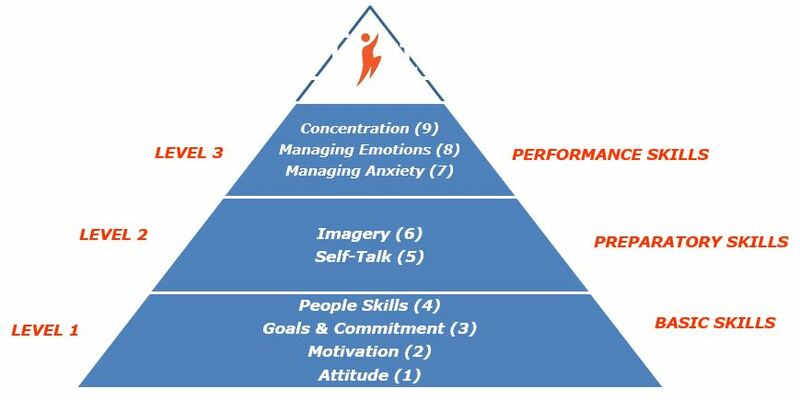 Performance Skills make up the top of the pyramid and are generally relied upon during the flow of play itself. In his work to qualify the effective use of each of the respective nine mental skills, Dr. Lesyk found that a score of 85% (out of 100%) for any one of the skills demonstrates effective use of that skill. 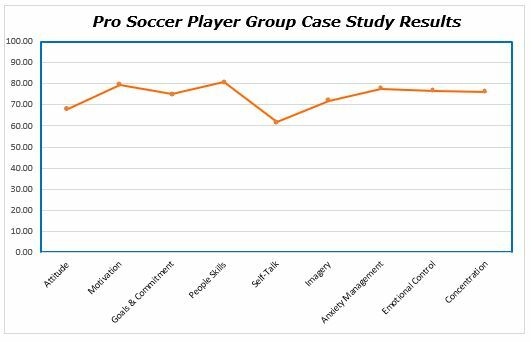 In combing the assessment results of the 30 pros and creating a group profile, we can begin to define the mental strengths and areas of need for our emerging pro players. 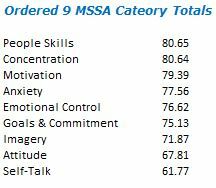 In general, the biggest point to consider is that none of the nine mental skills scores above 85% for the group as a whole! Remember, there are National Team players, MLS Cup Champions, and All-Americans in this group study. Many conjectures come to mind as to why these accomplished players fail to score above 85% in any one category as a group. The first, and most significant, might be that very little mental skills training is available to these young pros. Further, below you can see the exact scores for each of the nine mental skills. When we order the scores from highest scoring to lowest scoring we can really begin to define where these players would ideally begin a mental training program. Generally, as a Certified Mental Performance Consultant, I would suggest beginning work on the lowest three scores in the pre-season. In aggregate, the whole group didn’t score above 85% for any of the nine mental skills. Three mental skills scored significantly lower than all others: Self-Talk, Attitude, and Imagery. With Self-Talk and Imagery scoring so low, it appears that the Preparatory Skills section is the most under-developed of the three sections. People Skills, Motivation, and Concentration are the bunched tightly together as the highest scores and lend credence to this group of players being quality individuals who are motivated to do their jobs well and are close to being able to focus at an elite level. Consider the value in these young pros making improvements in their mental skills. 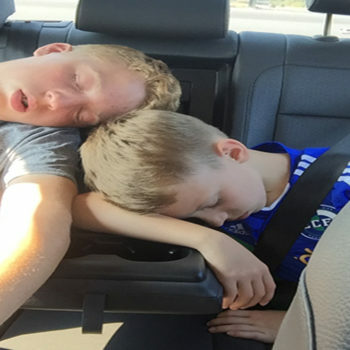 Imagine how effective they might be on the field in early season tight games if they learned how to better employ their Imagery, Attitude and Self-Talk scores. Stay tuned for the next post as we look at the positional breakdown of the nine mental skills assessment results.